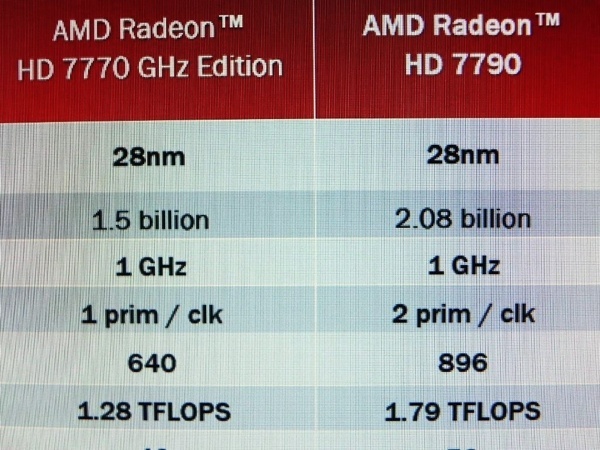 A presentation slide, allegedly by AMD, leaked by a Japanese distributor confirmed specifications of AMD's upcoming Radeon HD 7790 graphics card. According to the slide, the HD 7790 is indeed based on a brand new silicon, with a transistor count of 2.08 billion ("Cape Verde" has 1.5 and "Pitcairn" boasts 2.80 billion). The silicon is built on the 28 nanometer silicon fab process. The clock speed mentioned in the slide could be core, which is clocked at 1.00 GHz. Next up is the stream processor count, which stands at 896. The HD 7790 is mentioned to feature a primitive rate of 2 prim/clk, suggesting that its component hierarchy is more similar to "Tahiti" than "Cape Verde," which could mean double the tessellation processing power. All said and done, the HD 7790 belts out 1.79 TFLOPs of floating-point performance. The source goes on to mention in its text that the card features a 128-bit wide memory interface, memory clock speed of 6.00 GHz (96 GB/s), a TDP of 85W, and a single 6-pin PCIe power connector. It is expected to launch no later than tomorrow (22/03).